This is one I’ve been working on for a while. 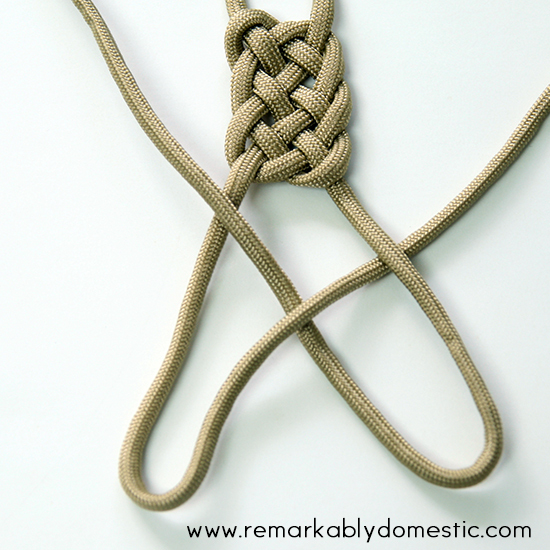 The basket weave knot seems tricky to tie at first, but once you’ve done it, it’s pretty simple. 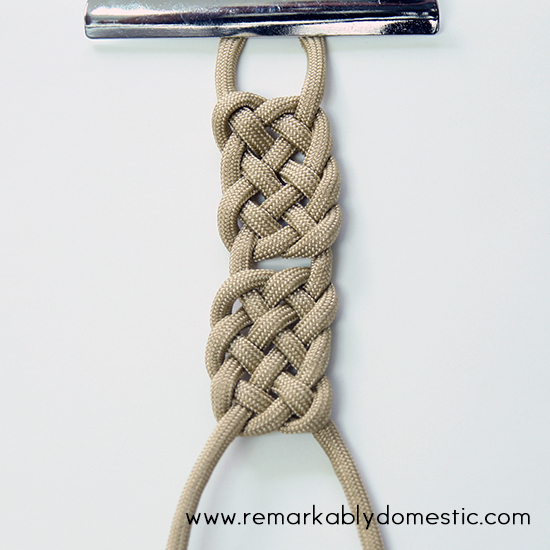 I learned it from JD at TIAT, so if you want to see a video of how to tie this knot, check it out here. 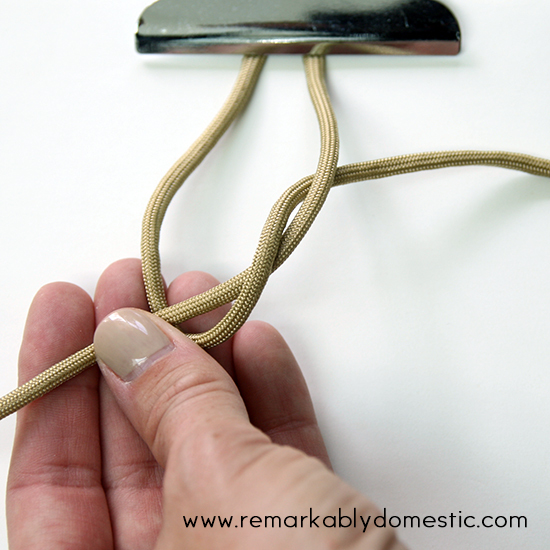 You’ll also want something to hold the cords while you are tying. 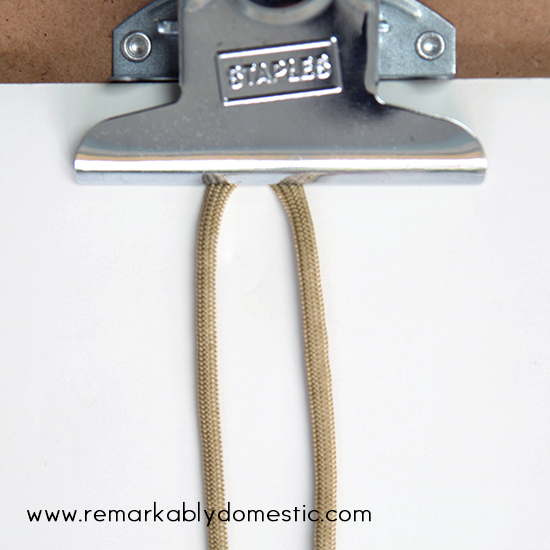 I usually use a clipboard, but you can also tape it to a table. To start, fold your cords in half. This bend will be your clasp loop. 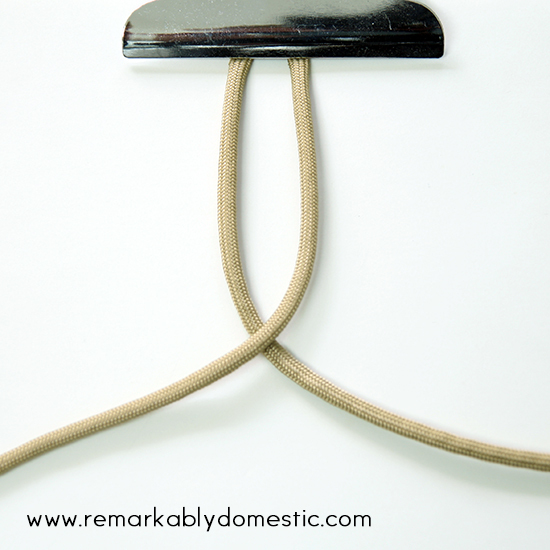 Attach this loop to the table or your clipboard. 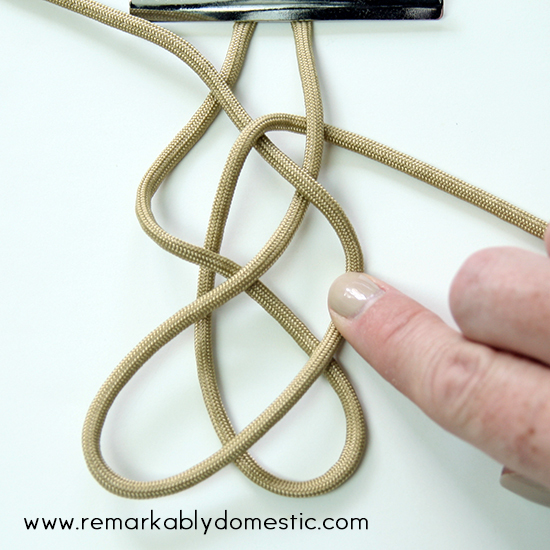 Start by laying the right-hand cord over the left-hand cord. Now the cords have switched places. 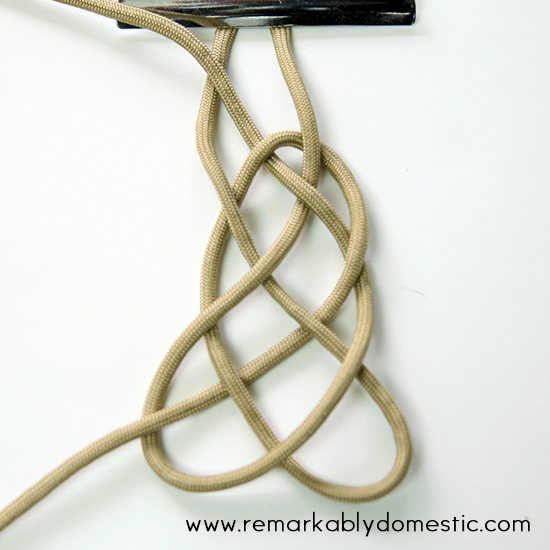 Take what is now the right-hand cord and bring it up and through the loop, and out to the right. This is the base from which you’ll weave. Straighten it out a bit. 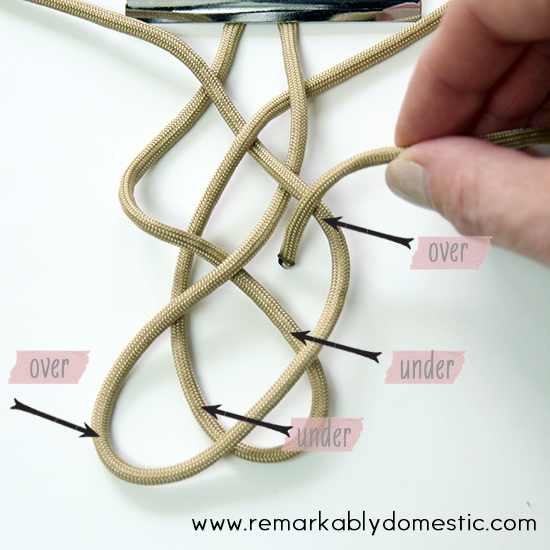 Now, loosen the knot up a lot, putting the ends pointing upwards. Next you are going to take each of these large loops and twist each one to the right. Do the right side first, and then the left side. You’re going over the first loop, under the two middle loops, and over the last loop. 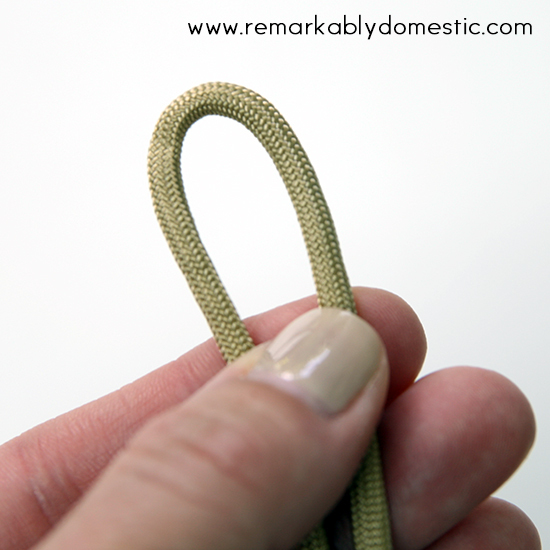 Tighten up this knot by gently pulling the threads through, starting at the top. You can tighten to whatever size you want. 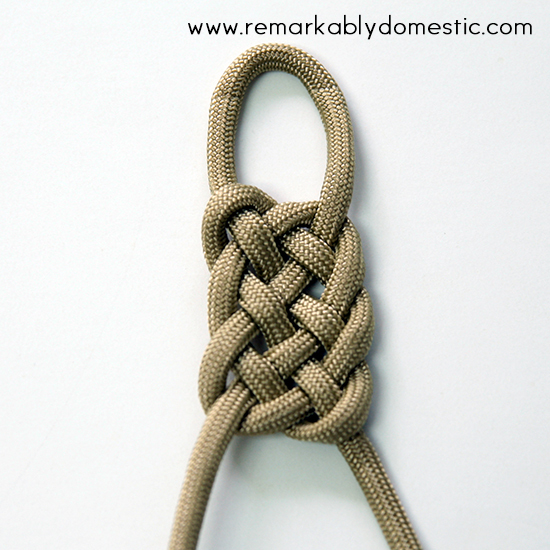 I usually like a smaller knot, so I tighten quite a bit. Now you can see what the knots will look like when finished. From here, simply start another knot. 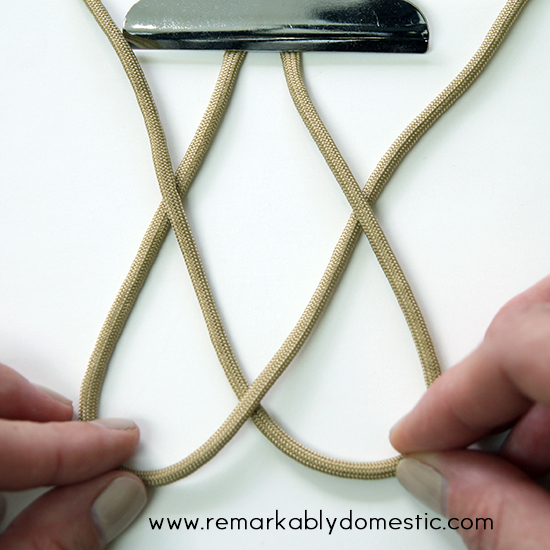 Follow the exact same procedure as the above for the second knot. 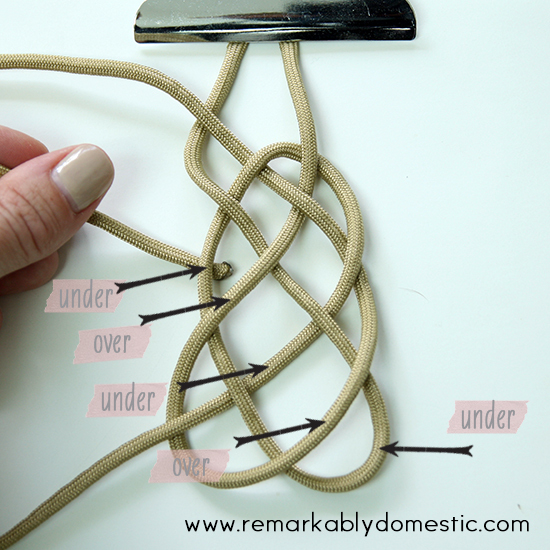 Once you’re done, tighten it up so it looks the same as your previous knot. 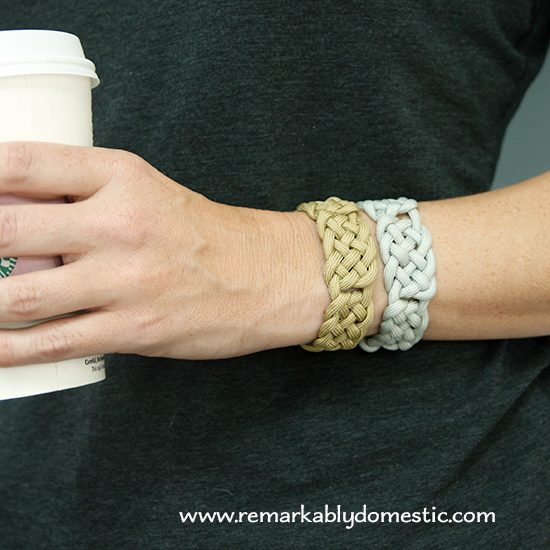 Continue knotting like this until the bracelet is the right length for your wrist. 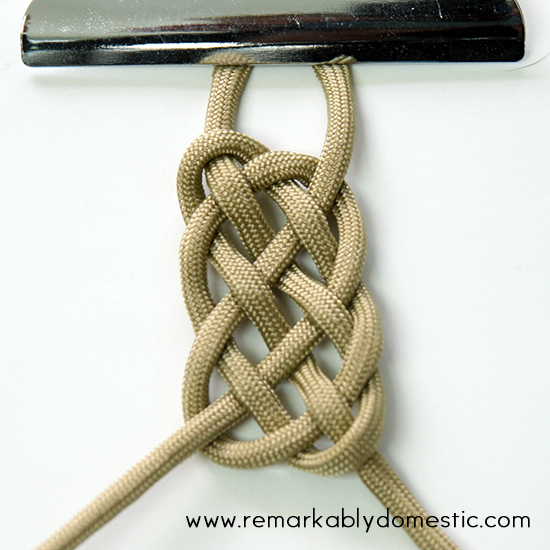 You could also leave more space between knots if you want a more open look. Add the button to the end by sewing it on. 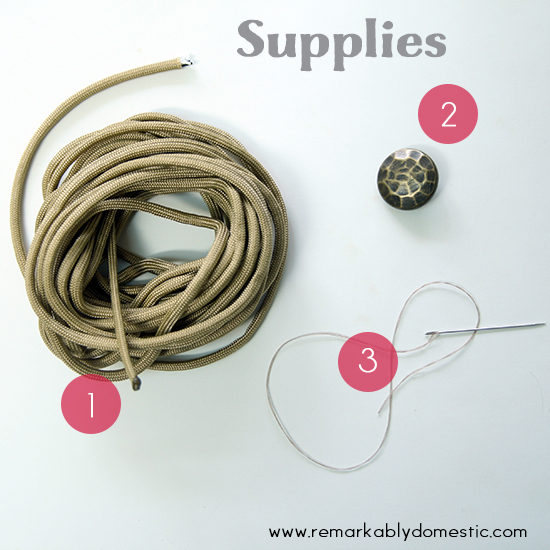 See my previous paracord tutorial for sewing a button with a shank on; if your button has holes, you can simply sew up through the cords and into the button holes. 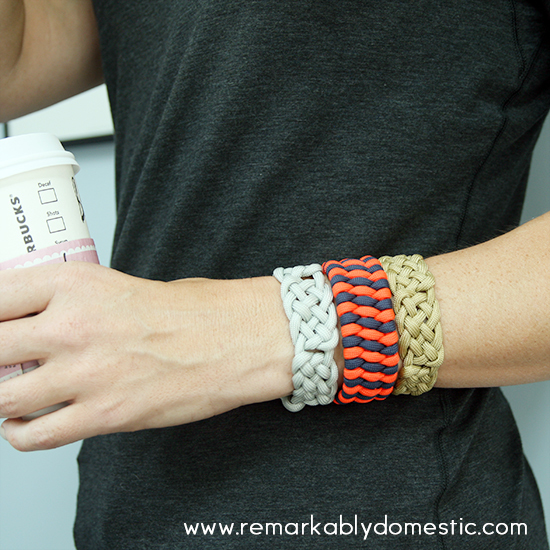 You can even stack them with other paracord bracelets, like the ones I made here. Hello! Would you please check up your tutorial, I am following it and it does’nt ends well, I love the bracelet and I want to do one for me. Thank you. I’m not sure which part is confusing for you. 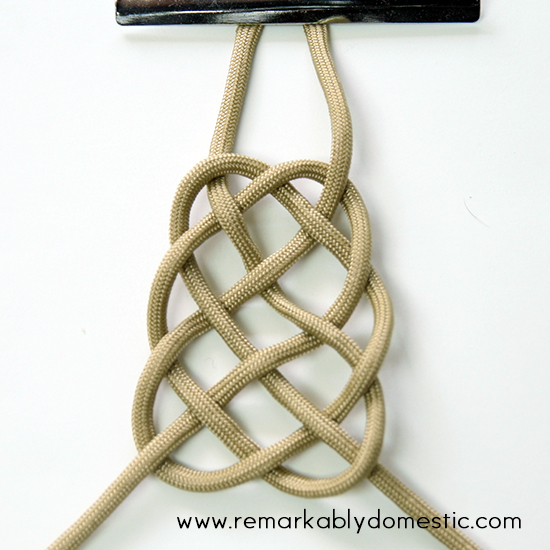 Everything is here; you need to simply repeat the first steps once you’ve completed one knot. 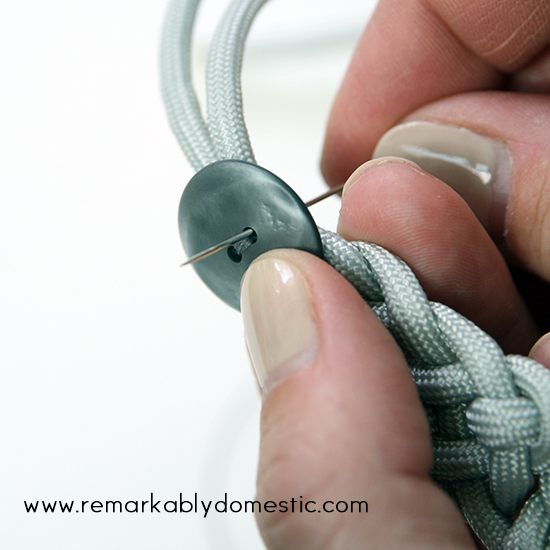 If you are looking for more info on sewing on the button, click on the link in the post that says more information about sewing on the button from a previous post. Let me know if that doesn’t explain it. The video for the basket weave braclet goes to a lulu hall video about clothes is that correct? Ooops! That was totally wrong. I just fixed the link. I don’t know how that happened! Thanks for bringing it to my attention! Using 2.5 feet of paracord males what size bracelet? Wow, I’m so excited, I did it. I’ve been wanting to try this but looked to complicated. Thx for sharing. Also went to the sites you referenced for buying cord. Do you have instructions on the orange and black one in the picture with the other 2 brackets? Thanks in advance. Thank you for such a clear set of pictures. To follow them is straight forward.